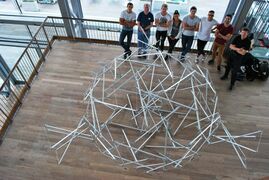 This page contains photographs related to the Tensegrity Goes Blob project undertaken by the Architecture students of Trier University of Applied Sciences in 2015. To read more about the project, read the Tensegrity Goes Blob by Trier University page. 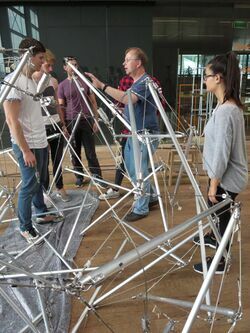 Assembling the Tensegrity Goes BLOB sculpture at IASS 2015. Photo by Bernhard Sill. 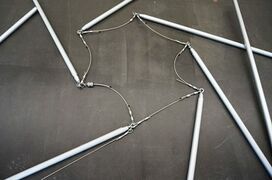 Awaiting rigging to life Tensegrity Goes BLOB. Photo by Bernhard Sill. 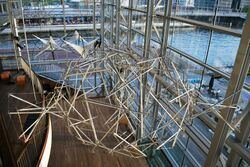 Tensegrity Goes BLOB sculpture hanging at IASS 2015, view from beneath. Photo by Bernhard Sill. 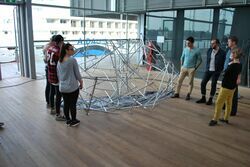 Tensegrity Goes BLOB sculpture hanging at IASS 2015, view towards window. Photo by Bernhard Sill. Tensegrity Goes BLOB sculpture hanging at IASS 2015, view from side. 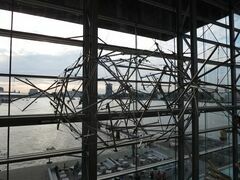 Photo by Bernhard Sill. 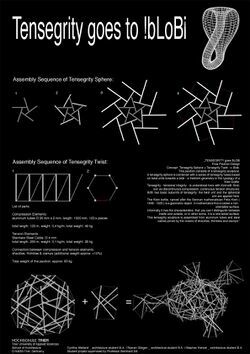 Tensegrity Goes BLOB small model and assembly with Kenkel, Weiland, Görgen. Photo by Bernhard Sill. 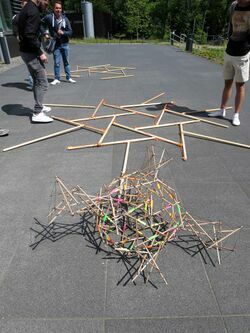 Tensegrity goes BLOB large scale model. 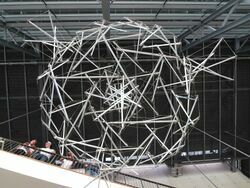 Photo by Lisa Bauer. 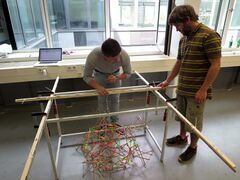 Measuring coordinates based on the Tensegrity Goes BLOB model. 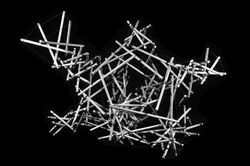 Photo by Bernhard Sill. Assembling the main sphere of Tensegrity Goes BLOB. Photo by Bernhard Sill. 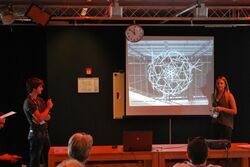 Presentation at IASS 2015, Weiland and Schäfer. 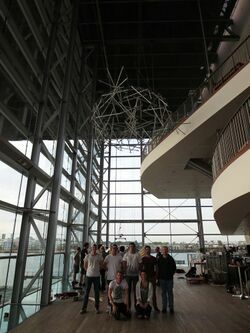 Assembling the wires of the sculpture, photo by Denis Grossmann. 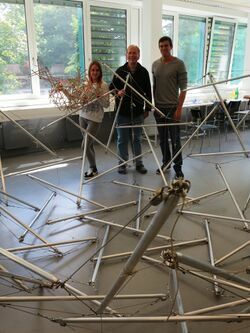 Tensegrity Goes BLOB sculpture hanging at IASS 2015, with team. Photo by Bernhard Sill. Working model of Tensegrity Goes BLOB sculpture, black and white. 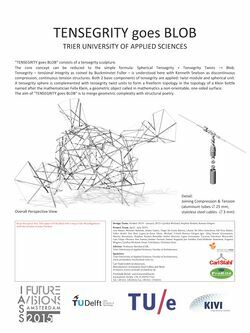 This page was last edited on 9 September 2018, at 12:23.